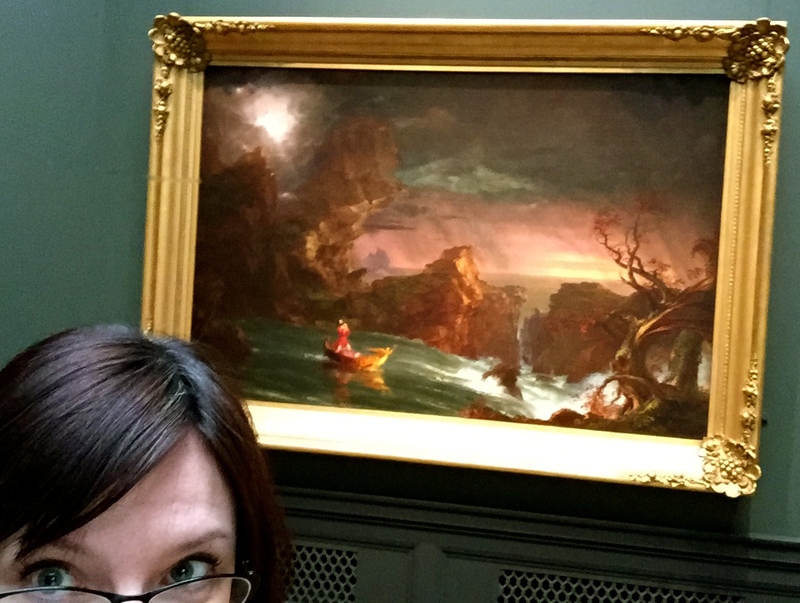 When I set up this blog last spring, I drafted four posts that would appear at the quarter-marks of my sabbatical (no matter what I was actually doing at the time), each of them illustrated with one of the Thomas Cole series Voyage of Life. (By Cole’s figuring, my sabbatical has moved from Childhood to Youth, which I like, since it looks like I still have lots and lots of time left. Away with you, Angel of Death!) Happy coincidence: part 2 commences just as I have crossed an important milestone in the project. Yesterday I finished my second complete edit of the draft manuscript. That’s thirty 5,000-word chapters in 23 full days of writing/editing (with very unruly end notes). I now have a very tall stack of papers next to me, the first and only time the whole thing in all its glory (?) will look like that. Editing has been just swell; but now it’s time to face some scary stuff. After years of drafting, outlining, researching, writing, editing, and being worried about it, it’s time to start the proposal for publishers. But in the words of the great Aragorn, today is not that day. Today is Thursday before a three-day weekend, so we will wait until Monday to start the process of selecting a slender portion of the Great Work to send with the proposal (and then eventually get around to winnowing this ridiculous pile into something more reasonable). Today, I practice a bit of strategic procrastination: planning to sketch out a paper, drawn from the ms., for a conference in June. The term “strategic procrastination” is my spin on John Perry’s “structured procrastination,” which basically means, have some little, not-horrible things to do when you can’t (for whatever reason) move forward with your big project. It’s a great concept, swiped from his interesting blog, which you should check out. That is, if you’ve got nothing better to do. Cole’s big blustery four-part Voyage of Life is at the National Gallery. PS This is my 50th post on this site. Sort of a nice & noteworthy milestone. People keep asking if I am excited about the start of my sabbatical. On the one hand I want (and do) say why yes, yes I am. On the other hand, I’m not quite sure when it really starts. 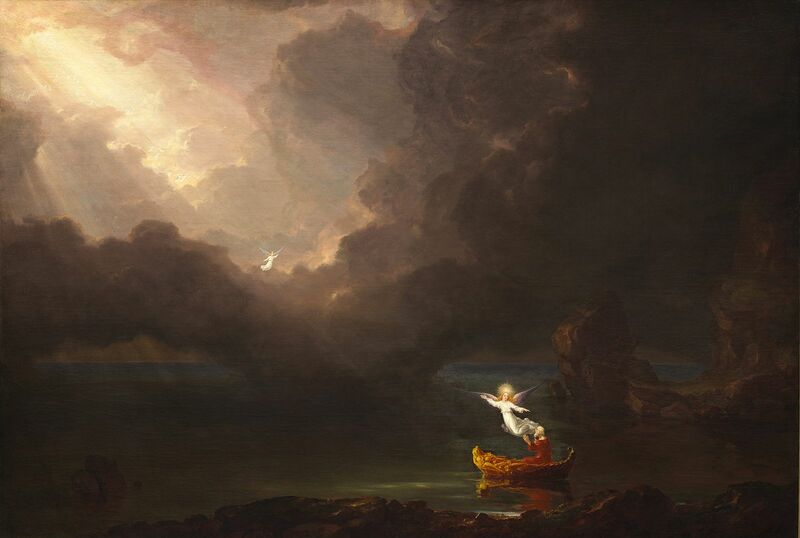 It’s not as clear cut as Thomas Cole’s voyager, who floats out of the dark cave and, voilà, his journey has begun. Maybe it starts on the last day that I have real responsibilities on my campus (today); maybe it’s later this summer when I settle down from a series of very cool travel opportunities and into the big research project; maybe it’s on the first day of the fall term at 9 AM when I will be in my slippers drinking coffee and tip-tap-typing on a laptop rather than in serious shoes in front of a classroom full of sophomore architecture majors and revealing the wonders of the syllabus. For lack of a better reason, for the sake of this blog, and recording (at least for my own sake) these fourteen months that I am more beholden to my muse than to an academic calendar, let’s say today. At the conclusion of my university’s annual spring faculty workshop, I am donezo, bags packed, figuratively and literally, ready to take off on a great big adventure. P.S. 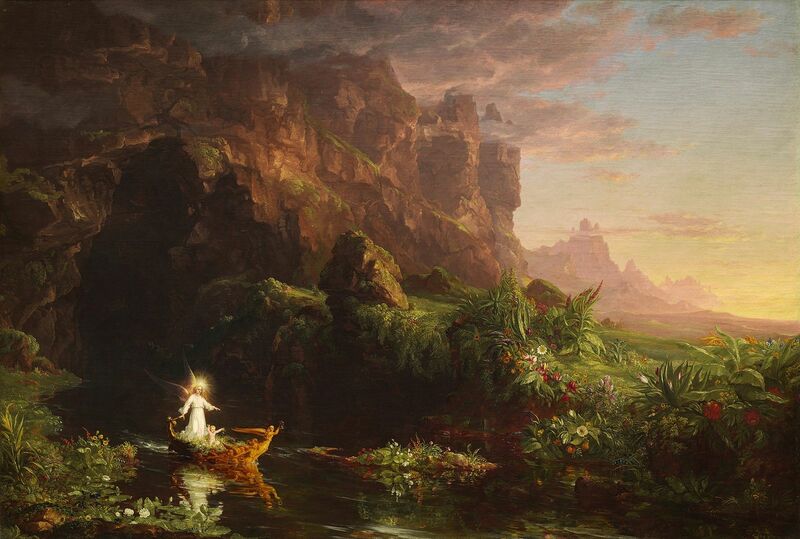 Cole’s big blustery four-part Voyage of Life is at the National Gallery.